A flexible and affordable alternative to traditional fixed panel or anti-collapse steel mesh systems. BSE supply and install rack netting systems from RackNets, providing a full, competitively priced end-to-end service including aftercare. Back of rack netting is a popular alternative to traditional anti-collapse steel mesh screens, protecting workers in the warehouse at a lower installation and maintenance cost. You can find out more about how these systems compare to fixed mesh systems here. Aside from the lower costs, there a number of proven benefits that make our systems from RackNets a popular choice in warehouses. Zero maintenance required once installed. Can be installed in half the time of a steel mesh system – around 400 square metres per day. Independently tested for full pallet load falls. Easy to install in confined spaces such as between narrow aisle pallet racking systems. Range of colours available – useful for segregating different areas of the warehouse. No high-tension wires reduce the risk of system failure. Due to the low-tension wires, stock that falls is easier to retrieve. Designed to contain loads of up to 1000kg. Adjustments and relocation much more practical than a steel mesh system. RACKNETS 2.3 – Designed to contain stock of up to 50kg falling from the rear of adjustable pallet racking systems. Download brochure. 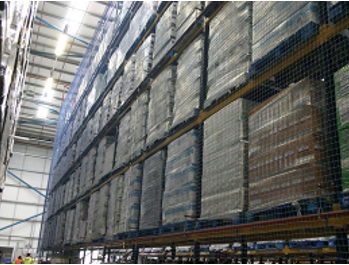 RACKNETS 3.0 – Designed to contain stock of up to 1000kg falling from pallet racking systems. Download brochure. RACKNETS 5.0 – Offering the same features as 3.0, developed for environments where enhanced levels of protection are required. Download brochure. 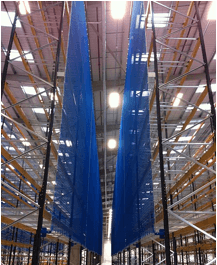 In-Flu Netting – In-flu netting is designed to be installed within the centre of the rack to prevent stock from being pushed through one aisle and out the other. Download brochure. Mezzanine Handrail Netting – This unique netting system is designed to be installed on the handrails of a mezzanine flooring system. Not only do the nets add extra protection for workers, but can also be used to support low-level pallets. Download brochure. If you’re interested in having a Rack Netting system installed in your warehouse or want to find out more about the benefits; give one of our expert team a call free today on 0117 955 5211. We’ll come to your site and recommend the best solution for you based on your individual requirements.